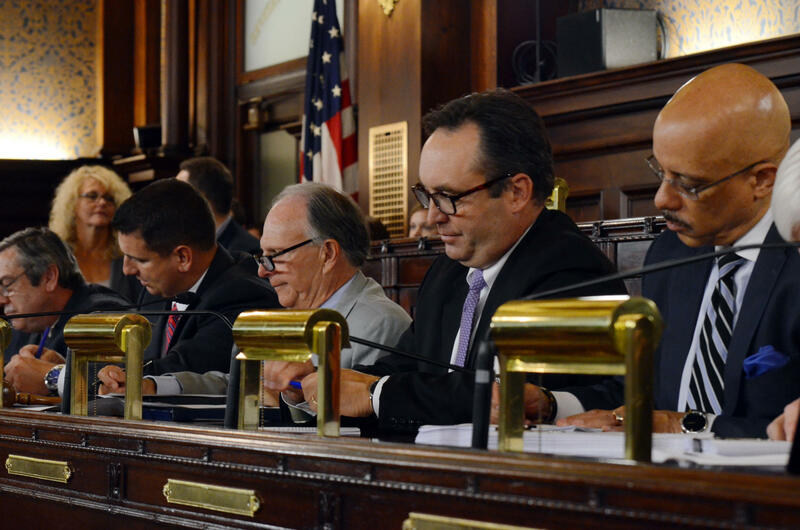 Senate Majority Leader Jake Corman, R-Centre, second from right, and other top state lawmakers on a six-member conference committee sign tax legislation before it heads toward an up-or-down votes in the House and Senate, Wednesday, July 13, 2016, in Harrisburg, Pa. Budget negotiators say the election-year tax increase is necessary to balance the state's deficit-riddled budget. After two days with an underfunded state budget, lawmakers have approved a revenue plan to balance the $31.5 billion spending bill. Governor Tom Wolf has signed it Wednesday evening, putting an end to the 2016/17 budget process. Wolf said the action saved the commonwealth from a repeat of last year’s budget debacle. The revenue package passed 116 to 75 in the House and 28 to 22 in the Senate. It notably includes income from tobacco taxes, gambling expansion, and liquor reform. It also includes a provision to apply the state’s sales tax to digital downloads, a measure that was added later in the negotiating process. However, some of the funds are projections, not assured revenue. In addition, the gambling expansion bill, estimated to be worth $100 million, isn’t expected to come to a vote until the fall. Senate Minority Chair, Democrat Vincent Hughes, says it was no easy feat to raise the money without broad-based tax increases. “[The bill] carves together smaller tax items in different areas—it took a little bit of extra time to verify those numbers and to agree on the final package—but I think this is a good piece, done at the right time,” Hughes said. The final plan includes $752 million dollars that will recur every year. The rest is one-time funding. All told, the bill reports just under one point two-nine billion dollars to fill the revenue gap. Voting on the bill was expedited by a conference committee, which passed an initial plan that the House and Senate could approve or veto. The chambers weren’t permitted to amend the bill.